1906 Indian head penny value of a well preserved example is over $7. Your coin, if it remains today without "problems" is sought by many. 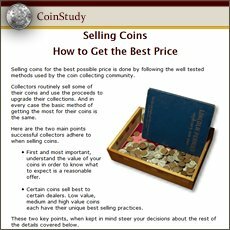 Value of old coins is determined by its acceptance by collectors. They seek quality and eye appeal. Not necessarily the ultimate in condition. An old Indian penny, worn but still pleasing in appearance is highly collectible. Major distractions or "problems" such as dark toning, bent or large nicks are primary factors in bringing down how much your 1906 Indian penny is worth. Escaping not only wear to is surface but still with its original luster is pictured a 1906 Indian penny in "uncirculated" condition, all design detail remains. These high condition pennies trade in the collectors market well above $100. Your coin may not fit into this category, however, it’s considered above average if feather detail is evident. Below the value chart, the section on "grading" your coin highlights differences to judge in quality. You have a coin with lots of potential for value. Many old coins are not as common as once thought. Underestimating better quality must now be avoided and is done by accurately recognizing condition. Discovering true 1906 Indian head penny value is the result. There are still to this day 1906 Indian pennies in "brand new" condition. They were never released into circulation but set aside by dealers and collectors at the time. Of these coins a certain fortunate few stand out as gem quality in preservation and appearance. Collectors avidly seek and pay high premiums for these top condition Indian pennies. Presented at a David Lawrence rare coin auction one of these rarities sold to a high bid of $460. As you view the coin to the right its stunning original luster and mark free surfaces are very rare among Indian pennies. Collector demand is always intense for gem quality. 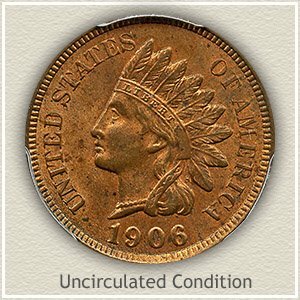 Value of lesser quality 1906 Indian head pennies may not reach into the hundreds of dollars, however their popularity among collectors is strong. Beginning collections evolve to advanced and your coin does fit into their needs. All Indian pennies are special. Judging the condition of your 1906 penny leads to its accurate value, perhaps higher value. The various stages of wear are defined by a "grade" represented by the following images and descriptions. 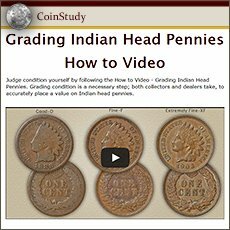 Uncirculated: Grading "uncirculated" and at the top of 1906 Indian head penny value no wear is present to its surfaces. Close examination is made to the ends of the feathers, hair and headband above her eyebrow and cheek and neck. These areas are the highest parts of the design and in the case of the neck and cheek, quickly show any wear. You are looking for a slight flattening to the normal roundness of the designs. A toning towards brown in color is expected on some coins. 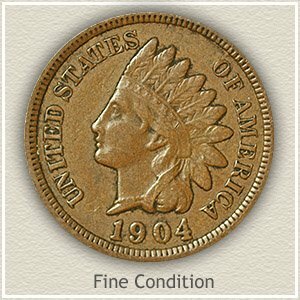 Extremely Fine: A 1906 Indian penny in "extremely fine" condition displays all major and minor design details. Your coin’s overall appearance is distinct and sharp. Light wear has begun to remove the roundness of the hair curls behind her neck. In the center of the ribbon over these curls portions of the diamonds are fading. Hair above her eye and along the lower headband is showing light but distinct wear. Overall a visually pleasing coin, with no distracting faults. Fine: As a coin begins to show moderate wear its grade is termed "fine." Feathers once finely detailed are now smooth at the ends and worn in the centers. Hair curls are no longer rounded in appearance with parts blending into the headband. Below the ear and behind her neck the headdress ribbon and hair is lacking detail and separation. Good: Worn to a shallow relief with little detail remaining describes a coin in "good" condition. The area surrounding the eye is slightly defined. Just visible is a separation of chin and neck. The headdress and feathers are worn smooth showing just an outline. Although the lettering and date are heavily worn they should be separated from the rim. 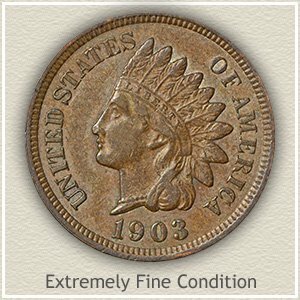 Your 1906 Indian head penny value may be at the low end of the scale but because of its history they remain an important coin. One of the stars of the coin collecting hobby, Indian head pennies with their bold distinctive design is a very popular coin. Common dates are now worth one dollar each. Many collectors are building collections and putting a heavy demand on the rare dates and better condition coins. 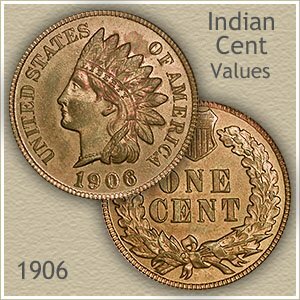 Find not only your 1906 Indian head penny value but all dates in the series are listed on the chart.